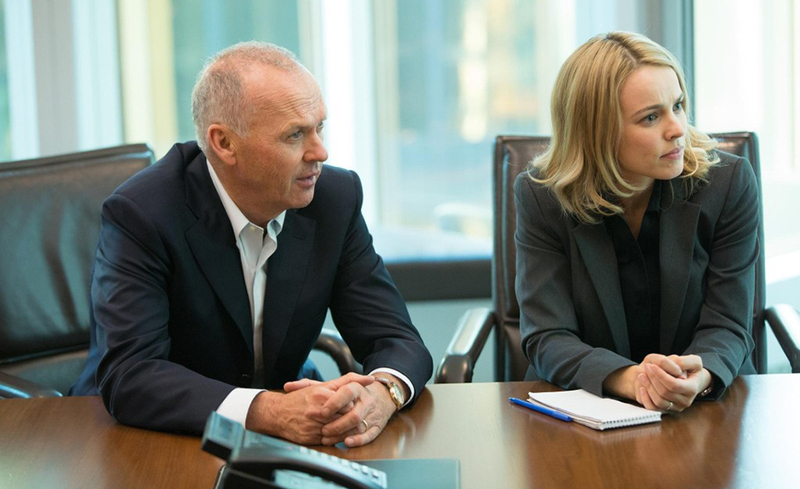 Joyce Glasser reviews Spotlight (January 29, 2016) Cert. 15, 129 min. Anyone who saw Writer/Director Tom McCarthy’s debut film, The Station Agent would have recognised the slow burning drama and touching humanity behind his talent. This was confirmed anew in his next film about an outsider, The Visitor and in his script for Up! Now McCarthy’s latest and most ambitious film, Spotlight , has been nominated for six Academy Awards including Best Film, Director and Original Screenplay. This time the outsiders at the core of the film are not only the victims of child abuse by Boston’s all powerful Catholic Church, but two quietly pivotal characters in the true-life drama: Mitchell Garabedian (Stanley Tucci), an Armenian contingency lawyer, and Marty Baron (Liev Schrieber), the newly appointed editor of the Boston Globe who is neither from Boston nor Catholic. 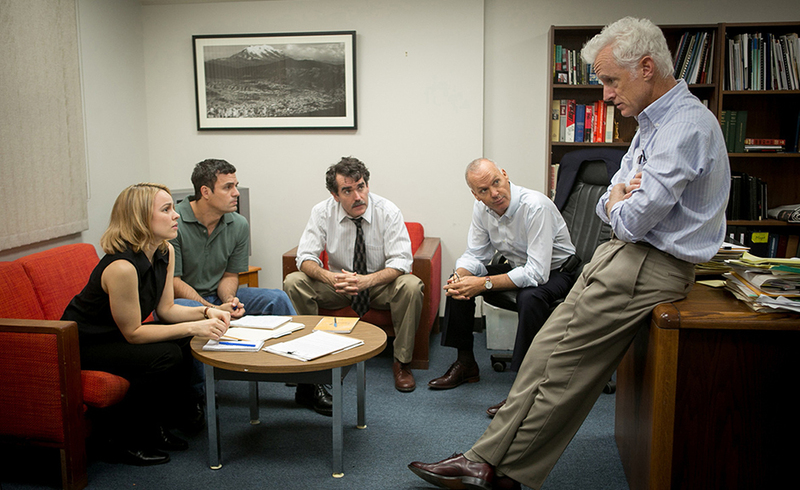 If Spotlight deserves its accolades, however, it is not just for its superb ensemble cast, and brilliant direction, but for casting a spotlight on the importance of investigative journalism, an expensive, but indispensible safeguard in any society. A scene from a local police station in the early 1990s, in which an Assistant DA goes into an interview room where a divorced mother of four is weeping, goes over our head, and its significance remains out there like a clue in a puzzle: one of many the viewer will be involved in piecing together. But in July 2001, the Boston Globe has a new editor, and the Spotlight team, the Boston Globe’s historic, award-winning investigative unit, is worried about lay-offs and autonomy. The Globe veteran and head of Spotlight staff, Walter ‘Robby’ Robinson (Michael Keaton, Oscar nominated for Birdman last year) has lunch with the new editor, Marty Baron (Schrieber), but it’s not going well. ‘Readership is down and it’s cutting into our classified’, Baron reminds a defensive Robinson. The future of the costly team looms large and Robinson’s offer of two coveted tickets to a Red Sox game is of little interest to the sedentary Baron. While the team believes they are tracking down and interviewing the victims of one rotten priest, their research reveals a series of patterns and gradually they have to believe the struggling ahead of an inconsequential victim’s rights group, Joe Crowley (Michael Cyril Creighton) that the scope of the story is much, much greater. Hotheaded, persistent, recently divorced and Catholic reporter Michael Rezendes (Mark Ruffalo) is assigned to track down the reclusive Garabedian (Tucci) while Catholic school boy Robinson chats with high level officials in the Catholic community. These include a friend, Jim Sullivan (Jamey Sheridan), a retired attorney who represented the Church. Catholic reporter Sasha Pfeiffer (Rachel McAdams, justly Oscar nominated for this role) interviews Eric MacLeish (a great, nuanced performance from Billy Crudup, Almost Famous) a dapper lawyer who is covering up more than he is revealing. It was MacLeish, the team discover, who ‘negotiated’ settlements between the Church and the vulnerable victims, but there is, conspicuously, no paper trail. At this point Baron tells the exhausted and traumatised staff that they cannot publish anything until they can prove that Cardinal Law knew about the cover up and did nothing. Checks and cross checks are required, doubling the work and the person fears for researcher and data whiz Matt Carroll (Brian d’Arcy James). Throughout the long, arduous investigation there are claims from MacLeish, Crowley and others that the Globe had been sent damning evidence years before and ignored it. While the interviews with the victims are sickening, the filmmakers focus on the behind-the-scenes investigation rather than the abuse. McCarthy’s and Josh Singer’s (West Wing), multi-layered, intricate and intelligent script is a wonder to behold. They not create dozens of compelling, three-dimensional characters, but generate real tension and drama from a painstaking, complex investigation. McCarthy’s careful pacing, supported by McCarthy’s regular editor, Tom McArdle (Oscar nominated for his work here) and Masanobu Takayanagi’s beautiful camera work allow us to take in the varied locations, and all the details and nuances. 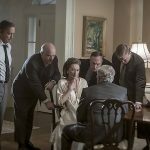 While Ruffalo is excellent in his role as the passionate reporter who takes the project personally, the two stand-out performances are those of Stanley Tucci and Liev Schrieber. If the real-life, controversial lawyer’s name, Garabedian, sounds like that of a shady character in a Raymond Chandler novel, McCarthy plays on that connotation, from Rezendes’ first, frosty visit to the suspicious lawyer’s shabby office to the unfolding of his personality and motives. Carefully couched anti-Semitism reappears throughout the interviews with defensive Catholic officials and academics, but it is Garabedian, an Armenian outsider, who points out that it took a Jew from Miami to take on the entrenched Catholic establishment in Boston. When the attacks of September 11, 2001 put the project on hold, Baron keeps the flame of the investigation burning. 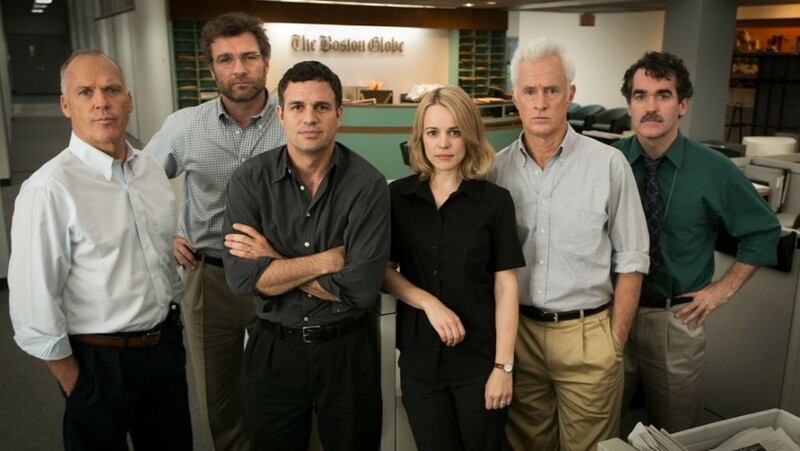 In addition to possessing all the hallmarks of an engrossing thriller, Spotlight deserves its six nominations for paying homage to the newspaper industry that was, in 2001 when the story begins, already undergoing such radical transformations that the future of investigative journalism was at risk. Every society, including democracies with checks and balances, needs a free press to question, probe, verify, and disclose hypocrisy and corruption. If no one buys newspapers, teams like Spotlight will not be sustainable.